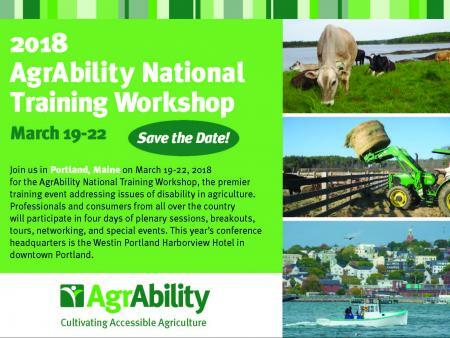 The AgrAbility National Training Workshop, the premier training event addressing issues of disability in agriculture. Professionals and consumers from all over the country will participate in four days of plenary sessions, breakouts, tours, networking, and special events. · Pre-Conference training sessions including New Staff Training and Reducing the Risk of Secondary Injury. · Two dozen educational sessions throughout Tuesday and Wednesday, providing staff development opportunities for AgrAbility Staff, VR, DVR, OT and PT professionals. · Wednesday evening banquet including a keynote address by Retired United States Army Staff Sergeant Travis Mills (https://www.travismills.org/ ) and our fund-raising auction! · Exhibitors displaying a variety of accessible technology, tools, mobility devices and more!